What Is the Medical Malpractice Statute of Limitations? No one anticipates leaving a hospital or other health care facility in worse condition than when they had arrived. Unfortunately, this is a reality for thousands of people each year in the United States. At Miller & Wagner, we help victims of medical malpractice obtain the compensation they need to replace lost wages, cover additional medical care expenses and for any other costs associated with medical negligence. State laws limit the amount of time an injured patient has to file a claim for medical malpractice. These time limits are known as “statutes of limitations”, and they vary by state. They are also very complicated and fact-dependent. It is important to speak to an experienced attorney as soon as possible to discuss these limits and determine how long you have to file a claim. If you wait too long, you risk losing your right to initiate any action against your medical provider. 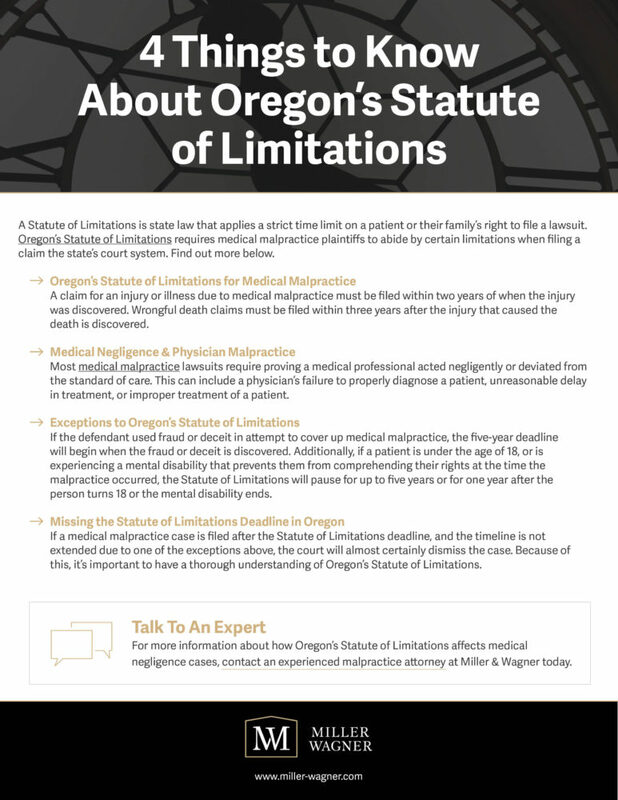 The medical malpractice statute of limitations in Oregon is complicated, case-specific full of potential traps for the unwary. If a malpractice lawsuit is not filed before the statute of limitations expires it will be summarily thrown out of court. So it is imperative that any person considering a medical malpractice claim contact an experienced attorney early on. In general, an injured patient must file suit either (a) within 2 years of the date the malpractice occurred, or (b) within 2 years of the date when the malpractice reasonably should have been discovered by the patient. But a malpractice lawsuit cannot be filed more than 5 years after the malpractice occurred. In general, if malpractice resulted in death, suit must be filed within 3 years. If a malpractice claim is being asserted against Oregon Health & Science University (OHSU), including any of its health care providers or clinics, or against any public hospital, clinic or employee, the law requires that an injured patient submit formal Tort Claim Notice prior to filing suit. An injured patient generally must submit Tort Claim Notice within 180 days of the date malpractice reasonably should have been discovered. If the injured patient is incapacitated the Tort Claim Notice period is extended up to 270 days. If malpractice resulted in death, Tort Claim Notice must be given within 1 year. Regardless, that statute of limitations for both injury and death claims against OHSU, as well as other public hospitals and clinics in Oregon, is 2 years. The so-called “discovery rule” mentioned above applies. The statute of limitations in Washington is not quite as complex as Oregon’s, but it is still case-specific. In general, an injured patient must file suit either (a) within 3 years of the date malpractice occurred, or (b) within 1 year after discovering the malpractice, whichever is later. At Miller & Wagner, we have helped numerous victims of medical negligence file claims quickly to ensure they do not lose their chance to receive significant compensation.